At Skyhook, we think of these data relationships and their application to solve marketing and business problems as location intelligence (LI). We've put together this starter guide to help you better understand location data, make it easier for you to talk about location intelligence within your company and help you decide if location intelligence makes sense for your organization. Let's jump in! Sometimes referred to as geocoding, location data is simply made up of latitudinal and longitudinal coordinates gathered from connected devices, like mobile phones. Latitudinal and longitudinal coordinates gathered from connected devices, like mobile phones. A system that accurately and precisely identifies geo coordinates is required to have high-quality location data. There are a few different ways to acquire this data, but at Skyhook, we use a hybrid location system that collects data from multiple sources: Wi-Fi access points, geo-located cell towers, Bluetooth beacons and IPs. The system allows us to identify two distinct types of location data for marketers and business analysts — device and venue location. Device Location: The latitudinal and longitudinal coordinates of specific devices, representing people in specific locations. Venue Location: The latitudinal and longitudinal coordinates of specific venues, like retail stores, sports stadiums, restaurants and malls. 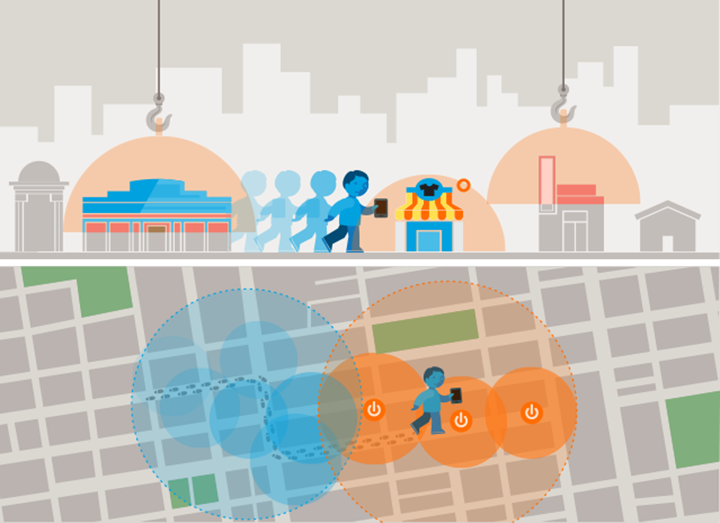 In other words, location data is simply information about people and the places they visit. With these two types of location data, marketers can determine what time of day to send specific in-store promotions and business analysts can find the best location in a to open a new retail space. Without location and venue data, and the ability to analyze the relationship between the two, location intelligence would not exist. What is Location Intelligence (LI)? After reading through the distinct types of location data, you may have guessed it — location intelligence is the collection of insights we can gather from the interaction between people and physical locations. Location intelligence is the collection of insights we can gather from the interaction between people and physical locations. At Skyhook, we define location intelligence as a methodology that marries location data and business data together to help solve a variety of business problems. What are the benefits of location intelligence? When trying to apply location intelligence to reach your marketing and business goals, looking at the work that other companies have done can help you generate ideas. Over the last 15 years, we've seen many different types of location intelligence projects. To inspire you to think about ways you can apply location data, we've included some of our favorite applications below. Location intelligence can help retailers and event coordinators better understand how people move around certain physical locations. This allows businesses to analyze movement patterns around specific venues, including events, to extract meaningful insights into the people who are there are and what they are doing. 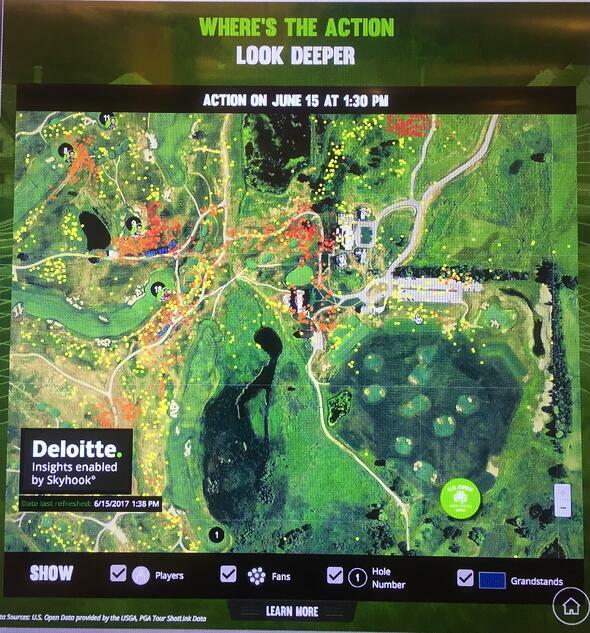 Last year we worked with the U.S. Open at Erin Hills to create interactive maps at the USGA Golf Innovation Experience. Using location intelligence, we generated real-time maps of the course and were able to display the most popular spectator viewing spots, capture demographic information and monitor the flow of foot traffic throughout the event. Aside from events, this type of location intelligence can be applied in many different ways, from monitoring store performance to measuring campaign effectiveness. For retail marketers to business teams who are looking to better understand how customers move in and around a store, foot traffic analysis with location intelligence is a must. You can gain a deeper understanding of your customers and prospects based on their overall movements and habits. Understanding where they go on an average day, or even during special events, can help provide the context you need to engage with them effectively through marketing campaigns in a more personalized way. Having this additional context about their behaviors helps you understand who they are as customers, prospects, and people. At Skyhook, we used location intelligence to gain market insights on Patriots and Falcons fans during Superbowl LI as a way to show the power of location insights. We were able to find distinct brand preferences in core categories like dining, shopping and gasoline preferences. 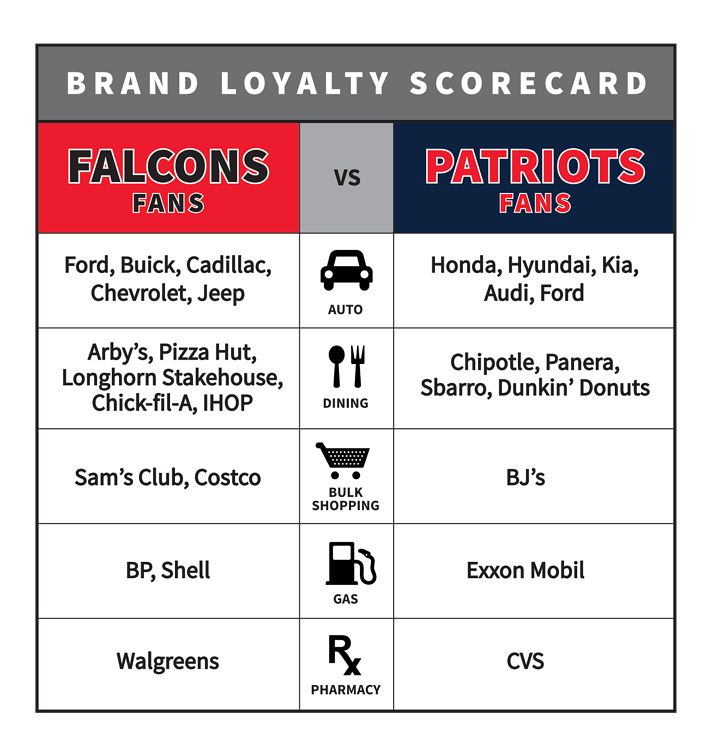 Falcons fans preferred dining at Arby’s and Pizza Hut, where Patriot’s fans were much more interested in getting food from Chipotle and Dunkin’ Donuts (if you live in New England, the latter might not seem quite like a surprise). Whether monitoring daily movement patterns or activity at special events, these type of market insights can be translated into advertising campaigns and strategic business decisions to maximize ROI and improve customer engagement. Usually known as geo-conquesting, location intelligence gives businesses the power to geofence competitor locations to get a better understanding of their customer foot traffic, buying preferences and loyalty — with the intention of winning over competitor customers in the long run. If you monitor a group of devices that visit competitor locations, then you can strategically send them promotions to try to win them over to your business — or if you find that your business is losing traction in a specific region, then you can better understand which surrounding stores are impacting your performance. Geo-conquesting, as a method for gathering location intelligence, can ultimately help retailers make better business decisions and analysts identify smarter investments. You have the ability to drive customer engagement by delivering personalized and location-specific content to customers based on their every day interests and behaviors. Knowing who they are as people, as opposed to just customers, can add a level of personalization that results in increased engagement and event conversion. We've seen use cases where large brands, like Home Depot and Trip Advisor, could use location intelligence to provide a more engaging user experience for people using their applications. Rather than a single app experience, location data gives stores the ability to create different modes within their app — like out-of-store or in-store. Each mode has the ability to feature relevant content based on the user’s current location. Skyhook's Context - What can your users' footprints do for your app? from Skyhook on Vimeo. A dynamic user experience, where an application has the ability to intelligently enter into different modes, gives businesses the ability to respond to a user’s current environment, creating more useful applications and targeted promotions. Location intelligence also makes it easier to increase consumer engagement by reaching people with content that’s most relevant to their surroundings, interests and behaviors. Rather than advertising to users through search engines or social media, location data provides a way for businesses to reach people in real-world locations in real time. One example of targeting using location awareness is Cardstar’s application of Skyhook’s location SDK. When a user is near a geofenced location, the app will automatically populate with relevant cards, key tags and promotions offered at the store. This is just one example of the many ways businesses can use location intelligence to improve targeting and engage customers through location-enabled interfaces. It’s difficult for advertisers to connect digital advertisements to in-store visits. Location intelligence gives businesses the ability to translate ad campaigns into real-world behaviors. For advertisers trying to understand how their online advertising spend translates into in-store customers, location intelligence provides the answer. Verifone Media was one of the pioneers in integrating location intelligence into advertising campaigns at scale. Using Skyhook’s technology, the company was able to identify people exposed to advertising campaigns and their behavioral response via foot traffic. Who can benefit from location intelligence? There are many applications for location intelligence, and each year, we find new ways of applying this type of data to achieve marketing and business goals. A report published by MarketsandMarkets even predicts the location analytics market size is will grow from $8.2 billion in 2016 to $16.3 billion by 2021, at a CAGR of approximately 17.6%. If you're looking to apply location intelligence to one of these industries or another, we hope you feel equipped with enough knowledge to advocate for yourself internally. We're confident that location intelligence will continue to play a major role in business development and advertising performance in 2018, so it’s no surprise that you may be thinking about leveraging location data to improve your bottom line. To learn more about applying location intelligence to marketing, business development or market research, visit our Geospatial Insights page.